Smile Makeovers for a Longevity Smile - Dr. Isaac Comfortes, D.D.S. Dr. Isaac Comfortes is well known for personalized smile makeovers that are life changing and last. Dr. Isaac Comfortes treasures the one-on-one relationships he has with his patients. Many have been with him for over 25 years. He calls them his “friends with Longevity Smiles.” If you choose Dr. Comfortes as your dentist, you can be assured your dental restorations (for example, crowns, bridges, veneers, prosthetic teeth on dental implants, and even simple tooth-colored fillings) will appear aesthetically perfect and natural. They will function optimally in your mouth, and your dentistry will last long into the future. 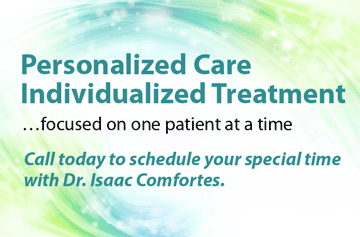 We offer a wide range of treatments, and Dr. Isaac Comfortes is a master of them all. Tooth whitening: Our at-home tooth whitening treatment can be used to lighten the color of your teeth by several shades, making you look years younger and giving you a stunning radiance. Using impressions of your teeth, Dr. Comfortes will provide custom-made whitening trays that you will wear at home with whitening gel. Porcelain veneers: Veneers offer some of the most comprehensive results in cosmetic dentistry. By bonding these custom-made shells of porcelain to the front of your teeth, Dr. Comfortes can cover up minor esthetic flaws and even reshape your teeth. To place veneers, he will minimally prep the tooth by removing a small amount of tooth enamel, then bond the custom shaped and colored veneer in place with resulting smooth, natural appearance. This is a more conservative treatment than crowning a tooth to reshape and resurface it. Composite bonding: In some cases, Dr. Comfortes applies composite resin to a tooth to improve its shape or to cover minor flaws. In other cases, porcelain veneers (or even crowns) are more desirable because the translucence and reflectivity of porcelain highly imitate the translucence and reflectivity of natural tooth enamel. Not only are the results even more lifelike than with composite bonding, but a veneer or crown restoration adds strength and can be longer lasting. Porcelain crowns: A dental crown is a tooth shaped restoration that completely covers the tooth surface. If your tooth has been injured or become decayed, Dr. Comfortes may recommend a porcelain crown (or a crown of porcelain layered on a metal core). He might also recommend a crown in the case of a severe tooth blemish, such as internal staining, or to reshape an irregularly shaped tooth. Tooth-colored fillings: If you have fillings that show when you smile, Dr. Comfortes can replace them with custom-matched composite restorations or porcelain inlays that perfectly match your natural tooth enamel and do not show. Some of our patients have metal amalgam fillings that he can safely remove before restoring each tooth to natural appearance and also greater strength than before. Conservative treatment of acid-eroded teeth: In 2003, Dr. Comfortes pioneered a new treatment modality to restore the tooth surfaces of individuals with significant dental enamel erosion due to bulimia and acid reflex disease. This conservative treatment combines porcelain veneers on the front of teeth and thin gold inlays on the back of teeth. 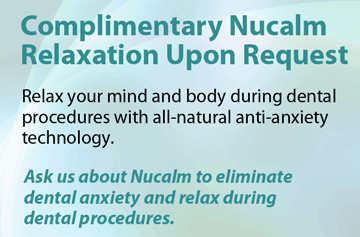 He has witnessed long-lasting results of more than a decade with this treatment. 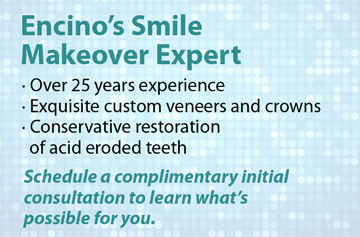 Sometimes, additional treatment goes into a complete smile makeover. If you have a “gummy smile” or irregular gum contours, periodontal procedures can be done to expose more of the tooth length or re-contour the gums. If you have a missing tooth, a lifelike prosthetic tooth can be supported on a dental implant or replaced with a bridge fixed on crowns. You may need or benefit from orthodontic treatment to perfect the spacing and alignment of your teeth. 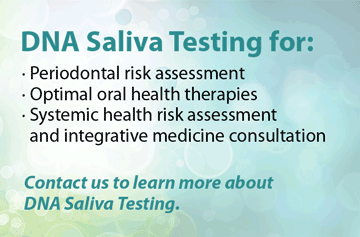 Before cosmetic treatment begins, you may need periodontal treatment to improve the health of your gums. And, if you have damaged gum tissue that cannot be restored with gum grafts, a treatment is available using custom fabricated gum prosthetics (gum masks).